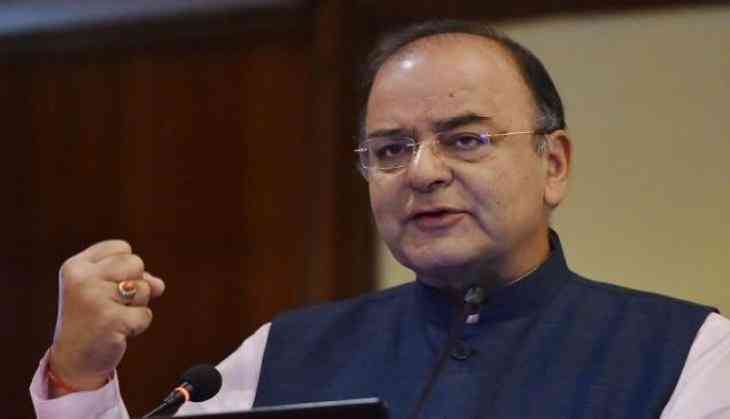 On 26 June, Finance Minister Arun Jaitley attacked the Congress on the 41st anniversary of the Emergency, saying that dark day was a blot on the grand old party's history. He said that Indira Gandhi had imposed the same solely because her position as the Prime Minister was then under threat. 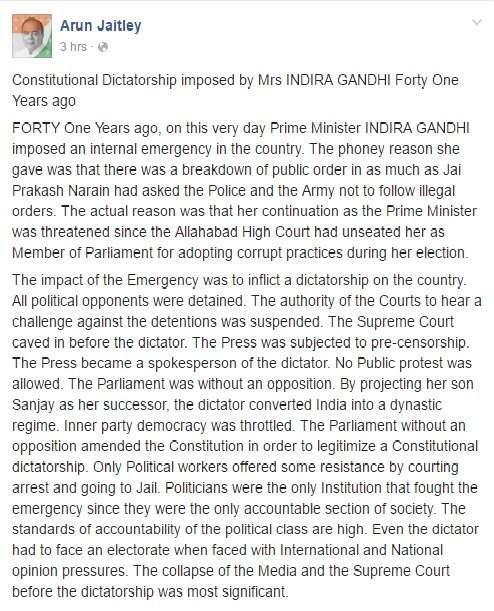 "The impact of the Emergency was to inflict a dictatorship on the country. All political opponents were detained. The authority of the Courts to hear a challenge against the detentions was suspended. The Supreme Court caved in before the dictator. The Press was subjected to pre-censorship. No public protest was allowed. The parliament was without an opposition. By projecting her son Sanjay as her successor, the dictator converted India into a dynastic regime. Inner party democracy was throttled. The Parliament without an opposition amended the Constitution in order to legitimise a Constitutional dictatorship". Asserting that only political workers offered some resistance by courting arrest and going to jail, the Union Minister added that politicians were the only institution that fought the emergency since they were the only accountable section of the society. "If one looks back at the history of the Congress Party after independence, the blots on it are economic reforms being delayed by over two decades, transformation of India in to a dynastic democracy, the imposition of Emergency in 1975, Operation Blue Star and Corruption," Jaitley said. He further dared the Congress' current leadership to express their opinion on this subject and asked whether they would have an internal debate on these issues. On 25 June, Union Home Minister Rajnath Singh said that the Congress committed a "historical blunder" by imposing the Emergency, adding that was the "most important" reason behind the grand old party's "shrinking base". "The Congress committed a historical blunder by imposing the Emergency on 25 June 1975. Now, the party is shrinking and its base is sliding. There are other reasons for it, but the Emergency served as the most important reason and the party is still paying its price," he said after paying tributes to the prisoners of Emergency rule. The Emergency stands as one of the most controversial periods of Independent India's history during which the 21-month period in 1975-77 when prime minister Indira Gandhi unilaterally had a state of emergency declared across the country. The Emergency was in effect from 25 June, 1975, to 21 March, 1977. The order bestowed upon the Prime Minister the authority to rule by decree, allowing elections to be suspended and civil liberties to be curbed. For much of the Emergency, most of Gandhi's political opponents were imprisoned and the press was censored.